A team is a family. The phrase has been used so often in the sports world lexicon that it’s prone to sounding trite or cliché. A team is a family. Is it predictable? Maybe. Overused? Possibly. But clichés are also this: they are true. To say A team is a family is to recognize that athletes and coaches bond together for relational reasons as strong and real as blood relatives do for genetic ones. 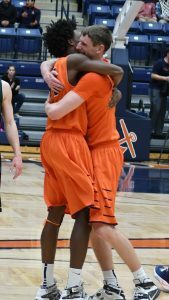 And at Hope, to say A team is a family is to also know that those familial feelings extend far beyond one team to encompass an entire athletic program, from administrators to support staff to parents to even spectators… for the sake of all and for the sake of one. 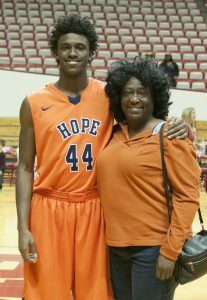 Just ask Hope junior basketball player Dennis Towns. Late in a game during his freshmen year at Hope, Towns was flying. A gravity-defying leap for a rebou nd — a Towns’ trademark lifted high a hundred times before in DeVos Fieldhouse — looked so superhuman that his hang-time bordered on the surreal. Well, at least it did until he landed. Reality hit when Towns came down to earth. Here, let him tell you. The “that” that Towns saw — as well as most in attendance in DeVos — was a foot pointing in a direction that no human foot is meant to point. It was turned out in an almost perpendicular manner to the side of his leg, a wrong-way right angle. Towns grabbed at his ankle in panic and pain. Gasps went up and then silence came over the crowd. Hope’s athletic trainers sprang into action while the faces of teammates and coaches expressed immediate concern. And in the stands, Towns’ mother, Carol, was distraught. After x-rays confirmed no break but a severe dislocation and after Carol Towns realized her son would be well cared for and play again at Hope, Dennis Towns went about the arduous work of rehab, hours of physical pushing and, of course, patience. And the support for the Townses kept rolling in. 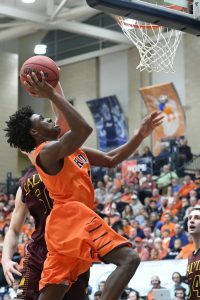 A get-well card was sent to Dennis from Hope basketball fans in attendance at a H-Club luncheon; athletic trainer Tim Koberna and jayvee coach Chad Carlson attended his first doctor’s appointment along with Carol; and, text and email messages of concern and well wishes dinged notifications of concern and encouragement to both of their phones. By his sophomore year, Towns was ready to play again; his ankle healed, he became an integral cog off the bench during Hope’s 2016-17 MIAA championship season. 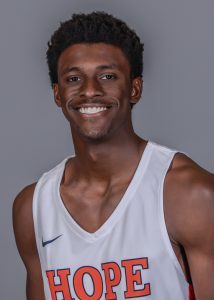 This year, the computer science major, who also dabbles in piano and speaks Japanese, is projected to be a starting forward. Those are words Towns appreciates though they’re not totally new to his ears. 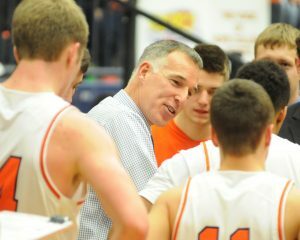 Mitchell has not only been a coach but a mentor to Towns, a voice of encouragement and direction. A team is a family. And not just for one season but beyond. For Mitchell, coaching basketball is as much about loving people as loving the game… and in that order. Learn a bit more about Dennis Towns here. One of our favorite prolate spheroids. As physical educators and coaches, we love SHAPES. From the rectangles, squares, and circles of our courts and fields to the spheres, cylinders, and prolate spheroids used in the sports and activities that we teach, SHAPES are important to us. 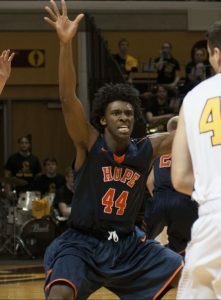 However, in the Hope College Kinesiology Department we recently celebrated a different type of SHAPE. In the past, you have been able to read regularly about the success of Hope athletes using the aforementioned “shapes,” but we would like to tell you how a group of students excelled in another SHAPE. On October 27, Hope College’s Physical Education faculty members traveled with eleven students to the SHAPE conference in Lansing, Michigan. 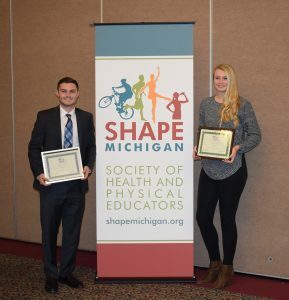 SHAPE stands for Society of Health and Physical Educators and every year this professional association holds a conference where students and professionals come together to attend sessions on trends in physical education and health. This annual meeting allows professionals to learn, discuss and examine current best practices as it relates to curricular design and teaching methodology. After the day long conference was completed, an awards dinner took place and that is where our story starts to take on a new form as several Hope College students took home prestigious SHAPE awards and scholarships. At this ceremony, each individual institution is allowed to select and honor its Major of the Year. The Hope College SHAPE Major of the Year award winners were Amanda (Mandy) Traversa and Michael Barnett. Hope College faculty in the Physical Education and Health program evaluate candidates for their academic standing, passion for the profession, and potential in teaching. Mandy (‘16) is currently teaching full-time in Brandon, Michigan. Her current teaching assignment is in the freshman physical education and health program at Brandon High School. As a student at Hope, Mandy worked hard to develop skills for teaching others what she is passionate about. Her growth over the course of her time at Hope was remarkable and the faculty is so proud of the teacher she has become. Michael Barnett (anticipated graduation in May, 2018) will student teach during the Spring of 2018 at West Ottawa Public Schools. Michael excels in the classroom. It makes no difference if he is the student or teacher. He is a very motivated and energetic teacher who thrives in the physical education setting. His care for students is deep, his energy is infectious and students are drawn to him as a role model and mentor. This past summer Michael was able to show his love for education and kids as he worked at Kids Rock Summer Camp in Zeeland. He planned activities for and impacted the lives of a new group of campers each week. Michael has a gift for teaching and Hope’s faculty is happy to acknowledge his great work with this award. 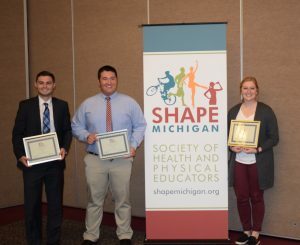 In addition to the awards selected and presented by Hope faculty, we also had three students win $1000 SHAPE scholarships. With only six scholarships awarded state-wide, this is a testament to the quality of teachers educated at Hope College. The scholarship winners were Michael Barnett, mentioned above, Michael Stephen, and Katrina Ellis. Michael Stephen, a fifth year senior, is currently student teaching at Holland Christian and will graduate in December. In addition to his student teaching responsibilities, Michael is also on the Hope College Football coaching staff, as an assistant offensive line coach. Based on past experience, we are confident that his positive impact on the lives of students will continue throughout his career as a teacher and coach. Katrina Ellis is currently student teaching in Hamilton where she works with middle school students. This is a perfect fit for Katrina as she is one of those unique and special teachers who are able to match the energy and enthusiasm of students in this age group. Like the other award winners, we are proud of Katrina who demonstrated hard work and commitment to her profession by excelling in the classroom while also balancing time as a student-athlete. Thanks for letting us share how shapes and SHAPE are important to us and our students. This year’s conference was a visible example of the quality of students and student-athletes that we get to interact with on a daily basis. We are so proud and grateful to play a role in the professional development of these amazing students. 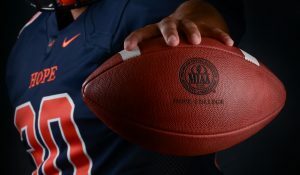 They represent themselves, their chosen profession, and Hope College in an extremely positive manner. We are proud of these young professionals and know that they are just starting to make a difference in the lives of students. Years in the future if students of these educators are asked to use a shape to describe their feelings toward them, it is our belief that they will think of a heart. They are truly special. Well done Ms. Traversa, Mr. Barnett, Ms. Ellis, and Mr. Stephen…..well done.